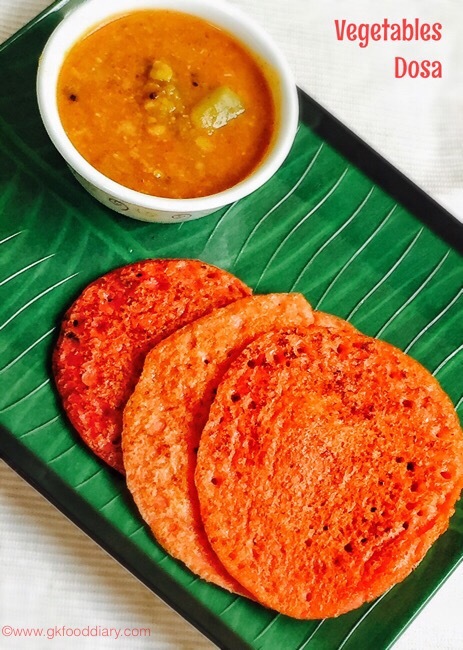 Vegetables Dosa - Healthy and wholesome vegetables Dosa for babies. Best for breakfast or dinner. Prepare idli dosa batter using Mixie or grinder. Keep it ready. Wash carrot, beetroot and potato in running water well. Then peel the skin off from carrot, beetroot & potato with a peeler. Then chop them into equal size small cubes. Steam the chopped vegetable cubes in a steamer for 15 minutes. I have used Philips avent combined steamer and blender for both steaming and blending. Alternatively you can steam it with Idli steamer plate by adding a cup of water or pressure cook the vegetables together with a cup of water for 3 whistles. Once the vegetables are steamed, blend it to make a puree. Now add the blended vegetables puree to the dosa batter along with cumin seeds. Mix well and keep aside. Heat a dosa tawa. Once its hot, pour a laddle of batter to it. Keep the flame medium to low. Spread a liitle to form a small circle. Then sprinkle ghee over it. Then cook covered with a lid for 3 minutes or until done. Once the dosa gets cooked, remove from the tawa. Repeat the process for remaining batter.